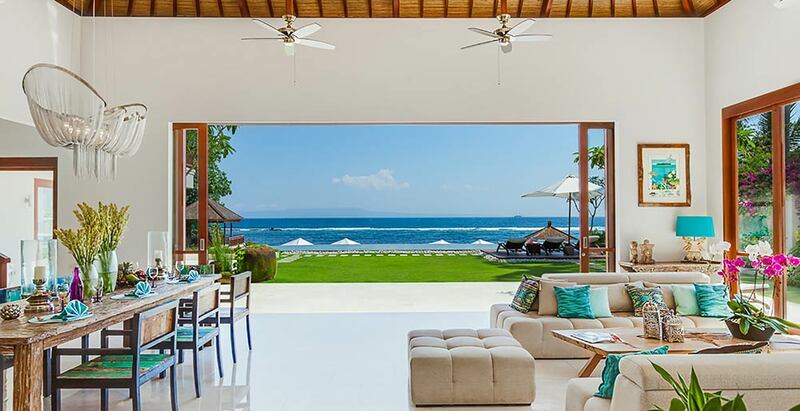 Set well away from the hustle and bustle of mainstream tourism, and resting absolutely seafront overlooking the spectacular Amuk Bay near Candidasa in East Bali, Tirta Nila Beach House is truly exquisite. This contemporary-styled villa presents four bedrooms, a large living and dining room, a cosy air-conditioned media room, pool, open-sided dining pavilion elevated above the water, and a man-made sandy beach and volleyball court with direct access into a sheltered lagoon with a coral reef. With its delightful team of fulltime staff including a manager and a superb cook, the villa is perfect for families and groups of friends.